Today we are going to discuss the use case of Mapegy, Jelastic Private Cloud Customer. Mapegy is a Big Data and Visual Analytics company from Berlin, Germany, that provides an innovation intelligence web platform to support innovation worldwide. During our interview, Falk Wolsky, Lead Developer and product owner of Mapegy shared the details about the company, their customers, and impressions from using Jelastic platform on top of ProfitBricks infrastructure. It`s already 4 years that we’ve started to publish different software around our main vision. Previously, it was an analytic SaaS, and now we integrate a more holistic web and mobile application as news, information and analysis SaaS platform. Current product direction was just recently launched for early adopters. We organize the world’s information on innovation by retrieving all R&D/innovation relevant publications and mapping data, key players and their topics into our “Innovation Graph”. What inspired you to create such product? Holistic innovation intelligence is still a pure manual process that needs highly specialized knowledge and experts. We are the first company, that offers this innovation intelligence – as a 360° view by automated big data analysis. 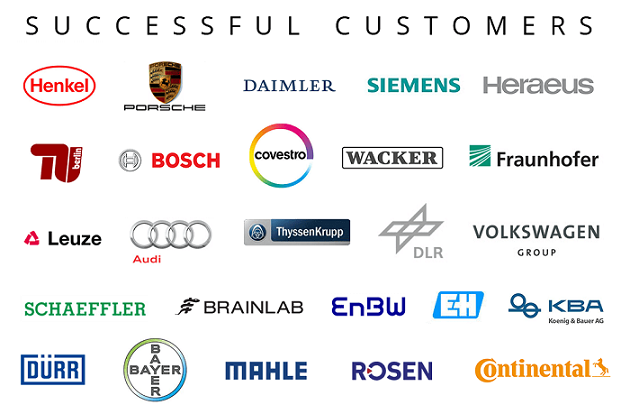 About 100 german and international companies in the “Fortune 500”. Because of fundamental pivot of our business model and product we aim to offer our platform for “everybody” – so we expect to have several million smaller users within 2-4 years. Currently, we are a pure B2B SaaS solution within the “innovation intelligence” market. R&D departments of big companies use our solution worldwide. Also, we are opening the platform to “everybody”, so any inventor, journalist, buyer, entrepreneur can use our platform too. What are your plans and expectations? Our plan is to open the platform, first of all, to the “subject matter experts”. It’s around 7 million people. We offer them a social network and information application focusing on their knowledge, technologies, and experience. In parallel, we keep offering our SaaS as an intranet platform for enterprises to support their R&D departments. Can you please tell us, what cloud hosting solutions you previously used? What was the challenge you faced while setting up and hosting your project? What problems did you have to solve? Flexible application scaling was our biggest concern. One of our chief goals was to gain flexible scaling for running a fast application that consists of many sub systems and operated in a perfect harmony within one single platform. Hosting expenses also appeared to be a critical issue for us as a startup company. Next challenge was gathering all parts/pieces of the application into one platform. Latencies between the systems and all this crazy stuff with configurations are the negative after-effects of an application platform, which is split across several service/hosting providers. How did you find out about Jelastic? Did you get recommendations from someone or saw a good feedback? I heard about Jelastic for the first time several years ago from dogado, a German hosting platform. It was a recommendation by a friend. Since then I`ve been following the Jelastic project and stay pretty excited about this fast and exceptional development of the product itself. Can you enumerate several key reasons to move to Jelastic? What features/services attracted you? The first reason was the possibility to scale application in a fast and smooth way at our platform. Ability to scale not only by web servers but also by resources per individual web server is really awesome! The second valuable feature is the possibility to run very different parts and technologies under one single rooftop using containers. It enables us to run databases, API middleware and, what is more, webservers and frontend all within a single environment. The ease of installing, configuring and managing environments is definitely a big asset. How have you set up your environment within Jelastic? Basically, we have 3 similar environments for dev, staging and production. Each environment has two Apache PHP application servers that are running WordPress application. The traffic between them is automatically distributed with NGINX load balancer. Also, they are connected to Memcached for data caching. Except that, we have two PostgreSQL databases that contain large amounts of data and complex materialized views. 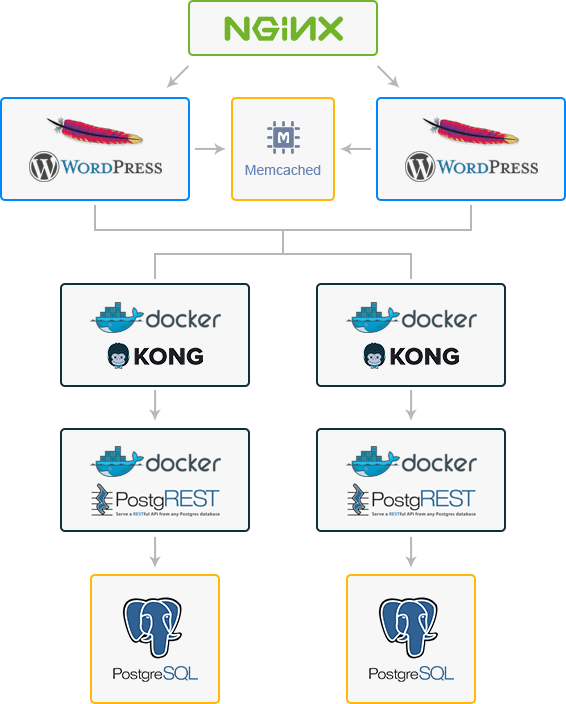 All the WordPress environments interact with these PostgreSQL instances using API generated via PostgREST server and Kong API gateway that run inside two Docker containers. What was the cost difference after migration? Our expenses on hosting were reduced from 12k to 2k per month. But the crucial factor, in our case, is more effective technology for running web application in containers. Are you satisfied with the Jelastic support? Yes! I was always satisfied. It was very fast and solves any problem within a short period of time. The positive experience with Jelastic support was one of the most important decision-making points for choosing Jelastic as a PaaS for our Application platform. There is less what I can “dream” of besides what is already existing. A native integration of postgREST beside the PostgreSQL databases could be a very interesting point for us. But we already can use postgREST in a really good way via the Docker containers. It would be great to see some more different databases, especially SOLR if we are talking about our platform. After the shift to Jelastic, we no more experience all this pain regarding running the company`s web application. THIS is the main point to choose Jelastic. I can focus on development and the tasks of the company. Hosting, scaling, and management of the whole application stack are easy with Jelastic and I save a lot of time. Sounds like a “marketing sentence”, but it is just the truth. Great to know that our product makes the life of developers and entrepreneurs easier. We wish Mapegy project develop rapidly and reach their expectations about millions of customers! 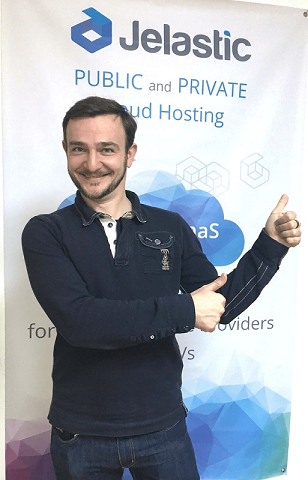 Interested in Private Cloud? Having troubles with scaling or managing your applications? Contact us and we’ll help to find the best solution.